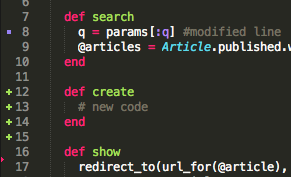 Git Gutter is a Sublime Text 2 plugin by JD Isaacks which shows an icon in the gutter area indicating whether a line has been inserted, modified, or deleted. Not a Sublime Text user? Don’t sulk away with feature envy just yet. Git Gutter has also been ported to Vim and Emacs.